Google Insights is no more. It has been absorbed by Google Trends. Both Trends and Insights have been useful tools for writers and editors looking to improve their articles’ SEO. Google Trends also lends itself nicely to a game I call “Celine Dion or Torture?” where you put in phrases until you find an unrelated, yet seemingly matching trend. Remember correlation does not imply causation. 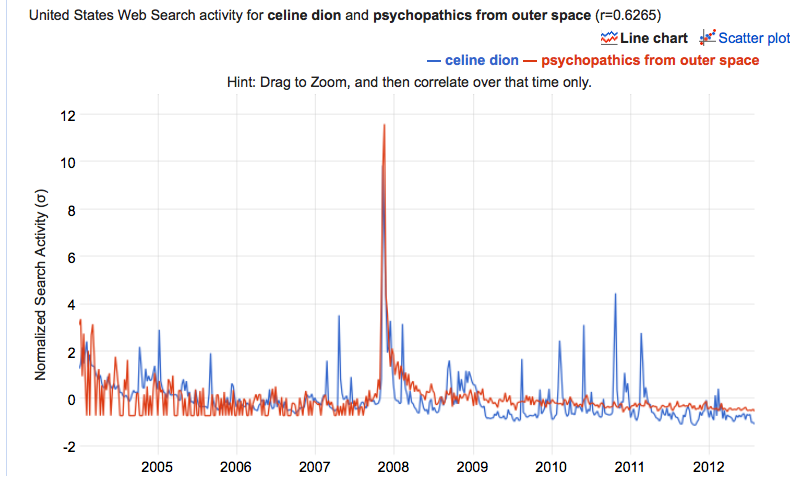 As you can see the search terms “Celine Dion” and “Torture” show a remarkably consistent affinity (except for November, 2007 when she released the album “Taking Chances.”) Click on the image for a larger view. If you need to cheat at the game, you can use Google Correlate . Correlate tells us that, for example, “Psychopathics from Outer Space” correlates even more than “Torture.” Hmm…makes you think. Who are the fans of both Celine Dion and Insane Clown Posse?